Have you heard any other cool Power Rangers movie quotes? Share in the comments! Jason Scott is also known as the Red Ranger, played by Dacre Montgomery and Sam Scott, played by David Denman, is Jason’s father. 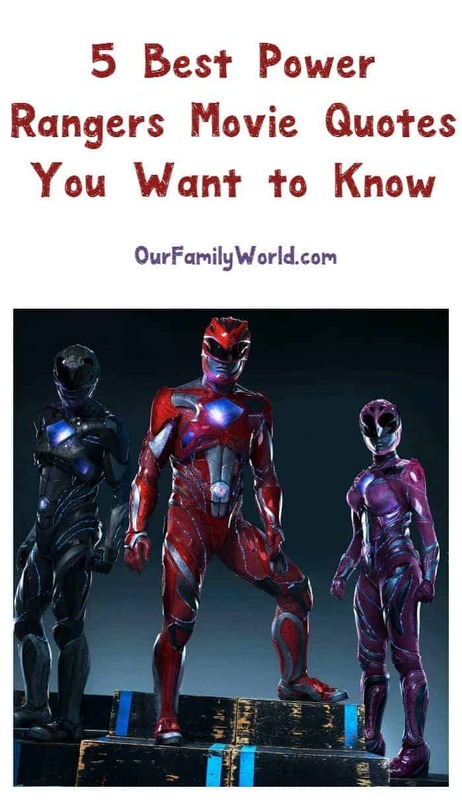 The five teenagers think they are just normal high school kids, until they discover they are the newest generation in a long history of warriors, called Power Rangers. Zordon is the mentor to the Power Rangers, voiced by Nicholas Bell in 1995 and Bryan Cranston in 2017. Rocky DeSantos is the Red Ranger, played by Steve Cardenas in 1995 and Dacre Montgomery in 2017; Kimberly Hart is the Pink Ranger, played by Amy Jo Johnson in 1995 and Naomi Scott in 2017 and Tommy Oliver was the White Ranger, played by Jason David Frank in 1995. Ivan Ooze was played by Paul Freeman in 1995. I love Power Rangers!! It’s like childhood days again!!! I’m excited for this movie! I used to watch the older one over and over when I was younger, so this is like my childhood relived. My son wants to see this movie so bad! I wasn’t as thrilled. But looking through the trailers you posted, maybe it won’t be as bad as I thought. How do you remember all those quotes? I remember my younger brothers and my older son watching Power Rangers. I remember the show when I was a kid. It was fun. I’m going to share your article with my husband and son who are fans of the movies. They are excited and looking forward to the movies.